NORWICH, CT - The Connecticut Tigers are proud to announce Norwich Navigators Night Saturday, as the Tigers host the Lowell Spinners at 7:05 PM. The game will pay homage to the history of baseball in the city of Norwich, which used to host the Double-A affiliate of the New York Yankees and San Francisco Giants. The team in Norwich was called the Navigators from 1995-2005, before changing names to the Connecticut Defenders and then prior to last season the switch to the Connecticut Tigers. The Tigers will wear Navigator jerseys and hats for the game, while the first 500 fans will receive a commemorative Navigators mini bat. There will be a silent auction during the game for the special jerseys and following the contest the winning bidders will be invited on the field where they will be presented with the autographed jersey directly from the player and/or coach. All proceeds will benefit the New York-Penn League Charitable Foundation. On June 3, 1994, the Yankees announced they would move their double-A franchise from Albany, New York, where it had been known as the Albany-Colonie Yankees since 1985, to Norwich, Connecticut, and would be known as the Norwich Navigators. Ground was broken for a new stadium (Dodd Stadium) in Norwich on November 3 of that year, and the team began play on April 6, 1995, with a win over Bowie. The home opener occurred 11 days later and was another Navigators victory (this time over Reading). Norwich reached the Eastern League playoffs four times in six years, with many current or former New York Yankees leading the way. On September 14, 2002, the Navigators won their first and only Eastern League championship with a five-game series victory at home over Harrisburg, under the direction of rookie manager Luis Sojo. 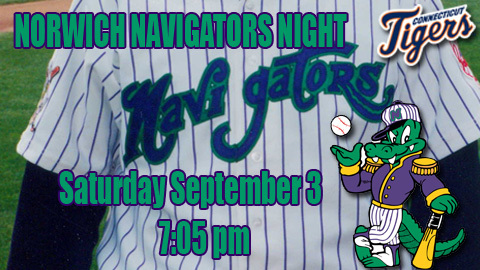 Some notable names that donned the Navigators colors were Alfonso Soriano, David Cone, Nick Johnson, Mike Lowell, Roger Clemens and Juan Rivera. Tickets to this and all games can be purchased at www.cttigers.com or by calling the Tigers box office at (860) 887-7962. You can also buy tickets in person at the Dodd Stadium box office, open on game days from 10:00 AM-8:30 PM Monday-Saturday and 10:00 AM-2:30 PM on Sunday.